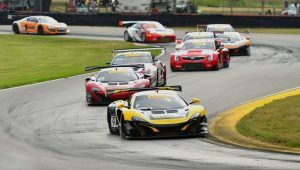 TOOELE, Utah – As 100 Pirelli World Challenge drivers head to the Utah Motorsports Campus Aug. 11-14, the spotlight is set to shine on heated championship battles that exist across all of the series’ eight classes. The Pirelli World Challenge Utah Motorsports Campus Grand Prix presented by Energy Solutions marks the ninth time the series will race at the 3.048-mile road course. GT and GTA drivers will race Rounds 16 and 17, while GT Cup pilots are set to race in Rounds 15 and 16. Rounds 3 and 4 of the SprintX class will run, while Rounds 14 and 15 are scheduled in GTS. For the TC, TCA and TCB classes, this event is the penultimate race weekend of their season, with drivers will racing in Rounds 9 and 10. While all classes feature tight competition, nowhere is the intensity hotter than at the very top in the GT class, with over 10 world–renowned manufacturers represented by many stars of sports car racing in the upcoming field. With a win in Round 14 at Mid-Ohio, Alvaro Parente stretched his lead in the GT driver’s championship standings, entering the weekend with 1308 points. The McLaren factory driver looks to add to an already impressive trophy mantle that includes the 2005 British Formula 3 championship, the 2007 World Series by Renault championship and the 2015 International GT Open championship. K–PAX Racing also brings two McLaren 650S GT3s, one each for McLaren GT Academy Driver and 2015 GT Cup champion Colin Thompson and young up–and–comer Austin Cindric. Thompson dominated in GT Cup last year, winning 13 of 18 class races, and will pilot the No. 13 K–PAX Racing machine. Cindric has raced in a number of series previously, including the Mazda’s Road to Indy’s USF2000 series and the Red Bull Global Rallycross Championship, and will pilot the No. 6 K–PAX Racing McLaren 650S. Cindric scored his first career PWC pole at Mid-Ohio. Porsche factory driver Patrick Long, the 2011 GT class champion, comes into the weekend second in GT driver’s points with 1213. Long lost ground to Parente after a frustrating Mid-Ohio weekend, where he finished 9th and 12th. He will pilot the No. 58 Porsche 911 GT3 R for Wright Motorsports. Long also looks to help Porsche repeat as GT Manufacturer’s Champions in 2016, with Porsche coming into the weekend only two points ahead of McLaren 104–102. Four–time and defending GT champion Johnny O’Connell sits fourth in the Driver’s Championship heading into the weekend with 1123 points. The Cadillac Factory driver won both races at Utah last year, and he will need to come close to matching that performance if he is to keep his 2016 Championship hopes alive. O’Connell will pilot the No. 3 Cadillac Racing Cadillac ATS–V.R GT3. O’Connell’s teammate Michael Cooper, the reigning GTS champion, comes into the weekend third overall with 1207 points after winning Round 15 at Mid-Ohio. Cooper will drive the Cadillac Racing No. 8 ATS–V.R GT3. Nissan Motorsports and Always Evolving return with two GT–R GT3s for JD Davison and Bryan Heitkotter. Davison comes into the weekend sixth in points, while Heitkotter comes into the weekend eighth in the standings. Up–and–coming sportscar racer Kyle Marcelli has been in the mix all season long, but comes off a challenging Mid-Ohio where he did not finish in Round 14 and took home no points. Marcelli currently sits seventh in the championship and will drive the No. 2 CRP Racing Audi R8. Absolute Racing will enter a Bentley Continental GT3 with Adderly Fong piloting the car. Fong won the 2013 Audi R8 LMS Cup and was runner-up in the 2015 GT Asia series. Fong will drive the No. 88 Bentley Team Absolute Bentley Continental GT3. Sports car veteran Jon Fogarty enters his second year in PWC and will pilot the No. 99 Gainsco Auto Insurance/Bob Stallings Racing McLaren 650S. Fogarty’s impressive racing resume includes 16 career Rolex Sports Car Series victories and two Grand–Am Rolex Sports Car Series titles, in 2007 and 2009. Fogarty’s best finish of the season has been third, coming in Round 2 at COTA. Calvert Dynamics Racing will return as well, with the No. 98 Calvert Dynamics/CurbAgajanian/Phoenix Performance/Brett King Designs/Boys Republic Porsche 911 GT3 R for Michael Lewis. Lewis has joined the Calvert Dynamics team after his previous team, EFFORT Racing, folded their operations for the remainder of 2016. Lewis won back-to-back races earlier this year at St. Petersburg. RealTime Racing comes into the weekend with a new look carried over from the Mid-Ohio weekend. Seven-time series champion Peter Cunningham owns almost every statistical record in PWC, but he’s moved out of his seat to allow another accomplished sports car veteran to race his Acura/HPD/RealTime Racing’s Acura TLX-GT in Spencer Pumpelly. Pumpelly’s teammate for the weekend, Ryan Eversley, has been on a charge recently – winning both races at Road America and finishing second in Round 15 at Mid-Ohio. He sits fifth in the championship and will pilot the No. 43 Acura/HPD/Red Line Oil/RealTime Acura TLX–GT. Rounding out the 15–car GT field is series veteran James Sofronas, in the No. 14 GMG/Spyder/Mobil 1/Thermal Club Porsche 911 GT3 R. Sofronas is set to make his 193rd and 194th series starts this weekend.